JEFFERSON - Two Ashtabula County organizations have something to be thankful for this Thanksgiving. Last week, the Ashtabula County Crime Clinic presented donations to Ashtabula County Safe Communities and to the Kids and Cops Campout sponsored by the Trumbull Ashtabula Group Law Enforcement Task Force. Jefferson Police Chief Wassie said the Ashtabula County Crime Clinic is comprised of administrators from the law-enforcement agencies in the county, as well as representatives from the coroner’s and prosecutor’s office and the Lake Erie Correctional Institution in Conneaut. The Crime Clinic serves as a sounding board to discuss issues facing law enforcement, Wassie said. The Crime Clinic was formed 15 to 20 years ago and used to collect dues, with the dues often being used for training and other programs, but with training costs rising and with changing tax requirements, Wassie said they have done away with the financial component and have now made the Crime Clinic a fraternal order. Kids and Cops Campout. Both organizations received a $1,520 donation last week, and around $1,400 had been given to Safe Communities previously. Wassie said Safe Communities, of which he is a member, will use the funds toward purchasing a second distracted-driver simulator, with the estimated cost between $8,000 to $10,000. “They would like to have two of these available so around prom time they can get these into high schools,” Wassie said. Safe Communities offers other safe-driving programs, including car-seat inspections, a safe driver program for young drivers and more. Geneva Police Officer Chris Cahill accepted the donation on behalf of the Kids and Cops Campout program. The brainchild of Det. Greg Leonhard, the Kids and Cops Campout has an aim of creating positive relationships with children and law-enforcement officers. Boys ages 8-11 in a minority population spend one spring weekend at Pymatuning State Park in Andover fishing, learning archery, canoeing, competing in team-obstacle course, roasting hot dogs on a camp fire, riding in a pontoon boat, feeding the fish at the Linesville Spillway and, of course, camping in the great outdoors. “We’re trying to make a connection back between underprivileged, minority youth and law enforcement,” Cahill said. For some of the kids, it’s the first time they’ve sat around a campfire or been camping, Cahill said. changed the lives of the officers and the kids. “That’s the difference and what the camp does,” Sargent said. 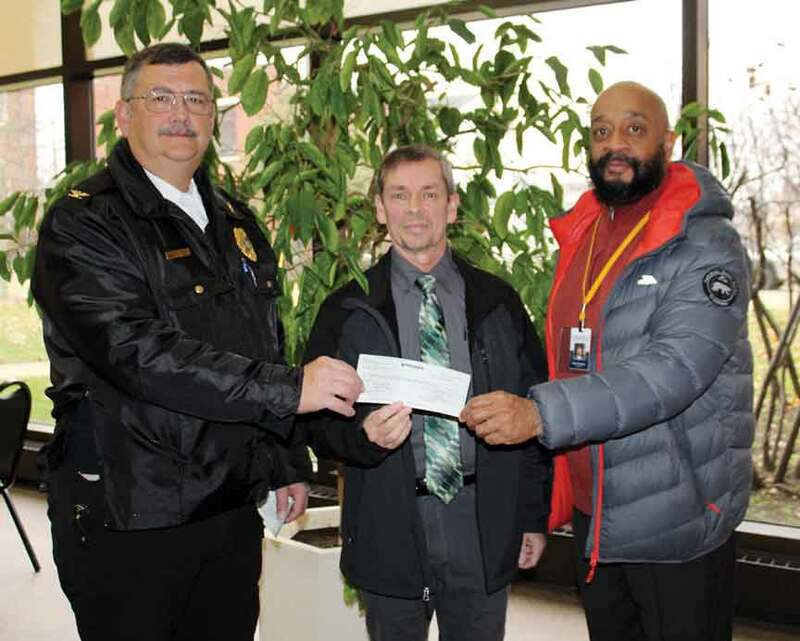 Last week, the Ashtabula County Crime Clinic presented donations to Ashtabula County Safe Communities and to the Kids and Cops Campout sponsored by the Trumbull Ashtabula Group Task Force. Pictured are Jefferson Police Chief Dave Wassie, representing the Crime Clinic and Safe Communities; and Geneva Police Officer Chris Cahill and Steve Sargent, director of the Samaritan House, representing the Kids and Cops Campout.